As I walked along my street in Ryde to the sound of birds chirping, dogs barking and nail guns hammering... a sense of expectation abounded for my first Keoride experience was about to unfold. I had so many questions; was it going to be on time, would the bus take me straight to work and would the bus be comfortable? 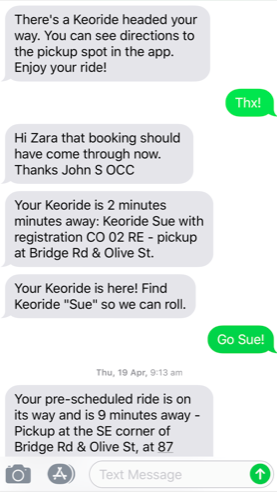 Keoride is an on-demand bus service that matches you with your colleagues working in Macquarie Park and North Ryde going in the same direction. It operates on weekdays at peak hours – from 6am to 10am and then 3pm to 7pm. Recently launched in partnership by Transport for NSW and Keolis Downer - Keoride uses sophisticated technology to coordinate your trip, picking you up from near your home, or a convenient location nearby, and taking you to where you want to go within the “on demand” service area. The night before I wanted to try the Keoride I downloaded the App and booked in my ride. It was really easy - just like booking an uber but for the price of an Opal ticket. In the morning Keoride messaged me and told me to meet up about 100m down the road at the arranged time. "Sue" my Keoride bus updated me every few minutes with its progress and I could track it on the App. Curious neighbours wondered why I was playing with my phone outside their house... they quickly concluded that I was playing Pokemon Go... yay! Right on time the bus arrived and Arj the driver greeted by name - a nice touch. We whizzed through the back streets to Triniti Business Park in North Ryde. I was able to catch up emails whilst Arj fought the traffic on Dehli Road. Jumping off the "Sue" at the pedestrian crossing outside my destination meant I avoided the peak hour car crush onto Juilis Avenue - arriving 15 minutes early for a meeting. Winning! The verdict: Keoride is a convenient, comfortable and safe way to travel to and from work. I'm a regular user now and the experience has been great. Give it a go! How do I book a Keoride? This map provides detail on the Macquarie Park service so that you can check whether your home is included in the on-demand trial area. The Keoride app enables you to book a bus to and from anywhere within the “on demand” area. To find out more - visit www.keoride.com.au.